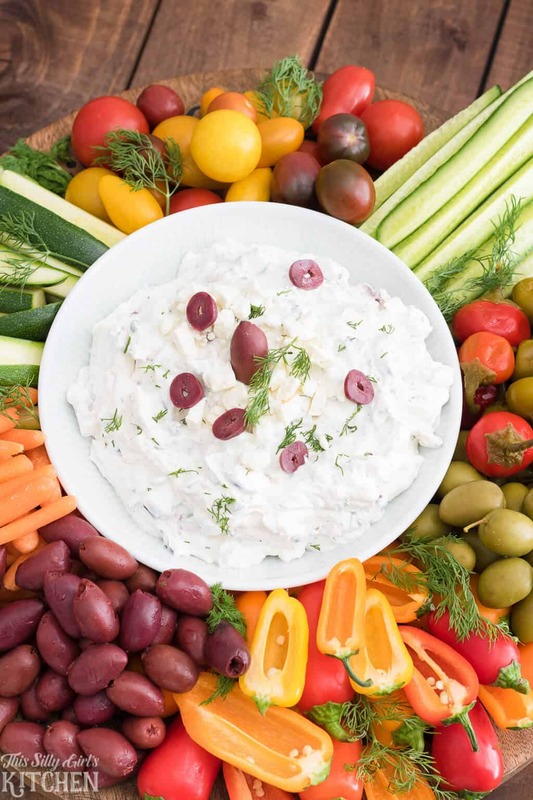 Greek Yogurt Dip, a creamy crowd-pleasing yogurt dip, loaded with traditional Greek flavors! 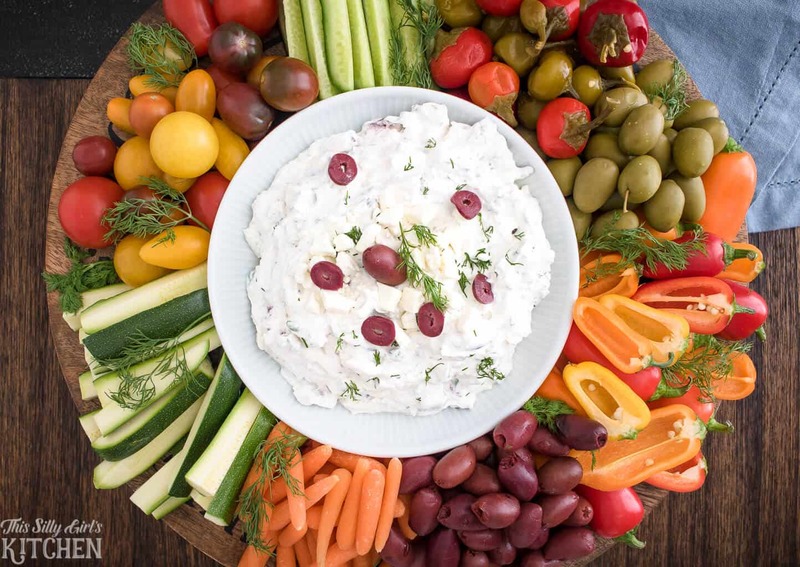 Greek Yogurt Dip, sour cream, Greek yogurt, garlic, feta cheese, kalamata olives, and spices make for one knock-out appetizer, side dish, or snack! Here’s the thing. I love dairy. Surprised? I didn’t think so. It’s amazing how one simple ingredient can be made into so many yummy products! My favorite type of dairy product is anything creamy. Yogurt, sour cream, heavy whipping cream… all these products can add another dimension of flavor and yumminess to so many recipes! Just like this Greek yogurt dip recipe! 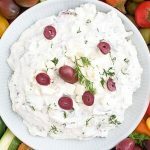 This Greek dip is so versatile, it goes great with veggies, but it’s also amazing as a yogurt salad dressing or sandwich spread! It is also extremely easy to put together like most dips. It is also a healthy alternative to other dips, especially store-bought because you know exactly what goes in it! While this Greek yogurt dip is for veggies, it is also for chips or even pita chips! I am also obsessed with appetizers of any kind. Give me a bunch of nibbles and I’m one happy girl. So, naturally, I love dips. 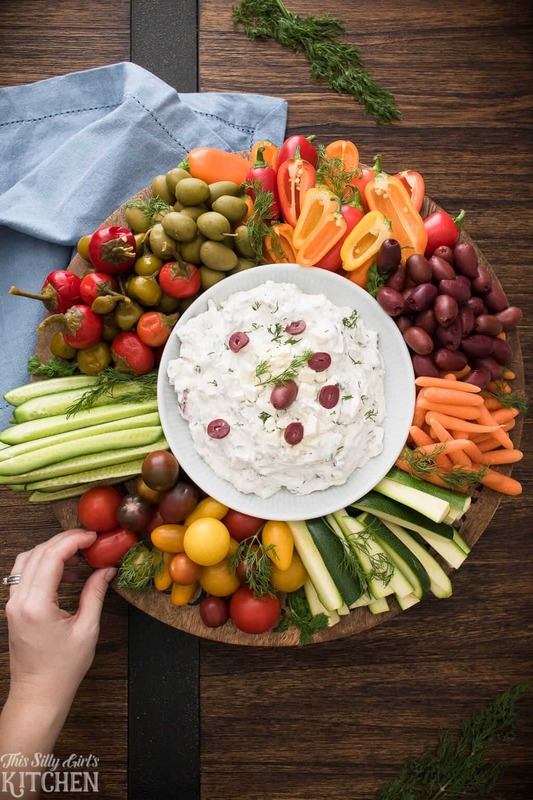 Is there anything better than a creamy dip with lots of yummy veggies to munch on? I think not! Also, dips are generally super easy to make. Literally mix together a few ingredients and you are good to go. This Greek yogurt dill dip is the same way. There are some fresh herbs and olives in it you need to chop up and that’s the hardest part, score! Rough chop parsley and fresh dill. Thinly slice scallion and minced garlic. Slice kalamata olives and add everything into a medium-sized bowl. 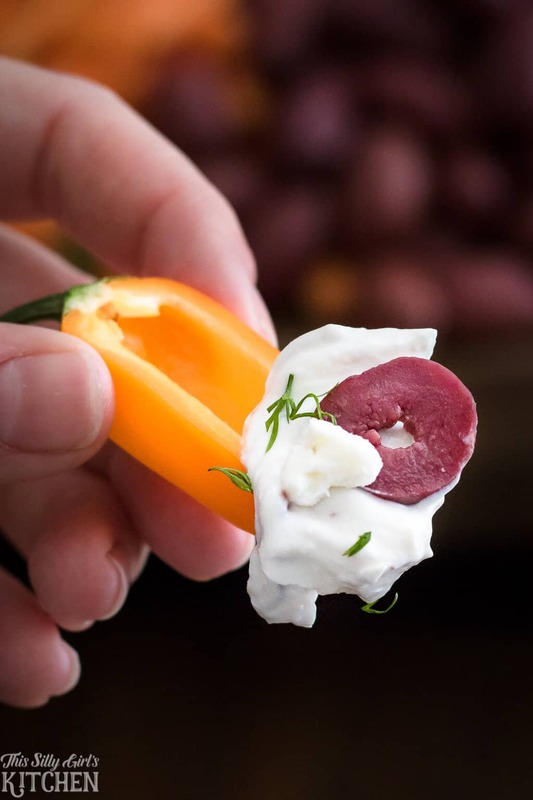 Mix-in Greek yogurt, sour cream, heavy cream, feta cheese, and dried spices. Mix to combine. Cover with plastic wrap and place in the refrigerator for 4 hours or overnight (I suggest overnight, the longer this dip sits the better it gets!). Serve with lots of veggies for dippin’! Even though this dip is super simple and made with wholesome ingredients, I do understand that you might not always have all these ingredients on hand. 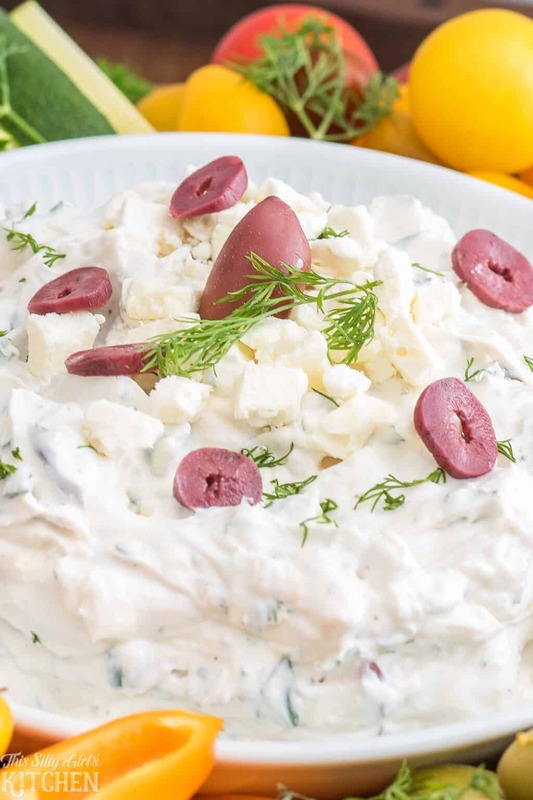 To make this dip a little simpler you can just mix together the Greek yogurt, heavy cream, garlic, feta cheese, and kalamata olives. It will still be extremely delicious but the extra ingredients in the recipe below give it an extra kick! This recipe makes enough to feed a crowd, feel free to half the ingredients if you plan on using it just for snacking for a couple people. What goes with Greek yogurt dip? You can also serve this dip with pita chips or crackers. It also makes an amazing spread for bagels, wraps, or even in place of mayo on a sandwich! Is Greek yogurt dip healthy? Believe me, this dip is amazing and totally addictive. But, it’s made with whole fresh ingredients so you know you can feel good about eating it! Like with most things, Greek yogurt dip should be consumed in moderation. Dairy naturally has a lot of good fats in it, so they are heavy calorie wise. However, since this dip is homemade and made fresh, we know exactly what is going in it making it a great alternative to store-bought dips. You can even make Healthy Greek Yogurt Buffalo Chicken Dip for a spicy kick! You can also make Greek yogurt ranch dip and Greek yogurt dip for fruit too! The possibilities are endless! How long does Greek yogurt dip last? When making any type of dip or recipe that involves multiple ingredients, the best way to ensure your recipe doesn’t go bad is to go by the expiration date of the item that expires soonest. So, check each item before you mix everything together, whichever one expires first, that’s when you know your dip is no longer good. A great way to make sure you know when your dip is ready to be thrown out (if you don’t eat it all first!) is to label your dip when storing it in the fridge. Can you freeze Greek yogurt dip? Absolutely! Just place it in a container suited for the freezer, make sure it is airtight. Then, wrap the container generously in plastic wrap. This will keep for a couple of months. When this dip is stored in the fridge or freezer, it might separate slightly. No worries! Just stir it up again and you are good to go. *The longer this dip sits in the fridge, the better it gets. I suggest leaving it overnight or longer.